Agnes & Viktor are approximately 12” tall. They are crafted from vinyl and hard plastic with rooted saran hair and hand-detailed, painted eyes. With jointing at the neck, shoulders, elbows, hips, and knees, they can assume the dreariest of poses. Agnes features a dedicated head sculpt on the Marley Wentworth Body. She can share clothing with 12" Marley, Alice and Dorothy, but it's unlikely she would ever want to. Viktor is Agnes' twin brother, so he shares her identical dreary look. 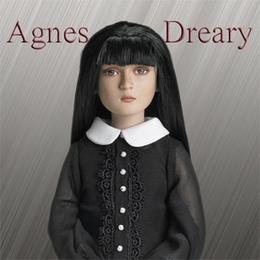 Sister Dreary is approximately 16” tall, and she is a vinyl and hard plastic doll with rooted saran hair and hand-detailed, painted eyes. With 15 points of articulated movement, Sister can assume even drearier poses than her younger siblings. Sister Dreary is a dedicated head sculpt on a smaller bustline 'Geisha' torso, featuring flat-feet with jointed ankles.